Milton residents trust VK Roofing, whether they are in the old town of Milton or in a new development when they need a new roof or need help with a roof inspection or repair. All staff are licensed, insured and covered by the Workplace Safety and Insurance Board (WSIB), trained and certified in working at heights and the Workplace Hazardous Materials Information System (WHMIS). We offer a diverse selection of products (shingles, ice & water shield, underlay and vents) from reputable suppliers. Our recommendations are based upon experience and customer feedback. 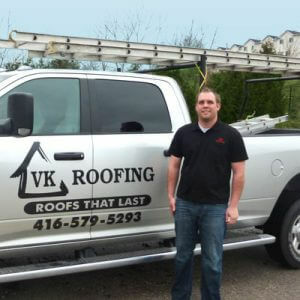 VK Roofing has built a solid reputation for excellent work on roofs throughout Georgetown, Milton, Brampton, Caledon, Bolton and Mississauga. Contact owner Anthony Van Kooten for a FREE No obligation quote. These guys were great overall, probably my best experience with contractors to date. They were on time, they worked non-stop and cleaned up well. I would definitely recommend Anthony and the team to anyone considering a new roof or roof repairs. Honest, reliable and excellent service. What else can you ask for? I would not hesitate to use or recommend them. Excellent job. The crew was friendly, professional and knew what they were doing. Got to work right way, and completed the job in just over a day. The quote and final price were exactly the same. The roof looks great guys! Definitely recommend VK Roofing to everyone that needs a roof done. Anthony and his team are meticulous and professional. I needed a new roof and this was totally pain-free, I wish more contractors would be like the VK Roofing team. From quotation to completion it was total 5-star service with excellent communication the entire way. Overall, a very simple experience. Their team was fast; 1 day for a 3 bdrm detached. Installation of shingles and new vents went without a hitch. They even advised me on a couple improvements I should do (roof antenna mount structure). Their quote was on par with other local companies, but I felt the materials they used were superior. Plus, Anthony was very personable and had good communication during the busy spring time.